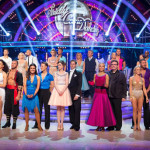 It was the Blackpool show in week 8 with Strictly Come Dancing heading north to the Blackpool Tower Ballroom, home of dancing. The nine remaining celebrities have done well to get this far in the competition but it hots up from here with popularity with the viewers now as important as impressing the judges for those wanting to stay out of the bottom two. Last week we had the viewer vote confirming the judges opinion as the two dancers on the judges leaderboard also ended up in the dance-off. Will it be the same this week? We will find out on Sunday night. There have been some re-assessments in the bookies odds this week with Patrick Robinson tumbling from 100-1 to 6-1 to win after his impressive dance last week. Sophie Ellis Bextor has drifted away a little to third favourite, Before the live show started we had Natalie Gumede as favourite to win the series with Susanna Reid now second favourite and Sophie and Patrick just behind. Lurking in the wings as 5th favourite is Ashley Taylor Dawson. We had Sir Bruce Forsyth back after a two week absence to host the show alongside Tess Daly. We will have to wait until Sunday night for Claudia Winkelman to appear. In the competition proper we had Natalie Gumede And Susanna Reid both almost perfect with scores of 39 and sharing the top of the leaderboard. At the bottom we also had two celebs sharing, with Mark and Fiona both scoring 29. Sophie Ellis-Bextor and Brendan Cole opened the show with a Quickstep to Shirley Bassey’s The Lady is a Tramp. Sophie has drifted away from the top of the leaderboard in recent week’s as her gawky style has not sat well with the judges. She seemed to have listened to the judges comments as it was a very smooth quickstep with elegance and energy. Sophie is back. Len: Full of intent and character. It was absolutely spot on. Fast, clean. Bruno: Your performance level tonight was so much better. The technique was good. Just check the top line. Craig: I loved the story. Your topline was lost at times. A little loose but the story telling was absolutely phenomenal. Darcey: You came alive. It was so beautiful. If only the top line was arched you would get a bit more. A score of 34, including a rather harsh 7 from Craig, was well deserved. Patrick Robinson and Anya Garnis were next up, performing the Samba to Barry Manilow’s Copacabana. Patrick earned hinself a 37 last week to top the leaderboard so can he maintain the high standard this week? Well it looked good from what I saw. Bruno: That was a blistering hot Samba. You captured the flavour so well. The variety of steps and the rhythm was close to perfection but there were a couple of slips. Craig: It’s just unfortunate that you had the mistake. It could have been dazzling. I would love to see it again in the semi-final or final. Darcey: It was a fast technical Samba. there were a couple of faults but it was superb. Len: That’s not a Samba it’s a wamba. You messed up one of the steps but you are a terrific dancer, please believe me. A score of 35 was a slight dip on last week but still very respectable. Ben Cohen And Kristina Rihanoff danced the American Smooth to Fallin’ by Alicia Keys. Ben was more formally dressed this week so there was no danger of him removing his shirt. Ben is certainly getting better and looked like he had raised his game. Mind you he needs to do that just to keep in touch with some of the better dancers. Craig: Big Ben is back in the ballroom. A very quick viennese. A vast improvement. Darcey: You carried it off with ease. That presage lift into arabesque is very difficult. You do need to think what to do with your arms. Len: You’ve fully committed yourself. When you are out of hold it goes a bit adrift but overall lovely. Bruno: That had warmth and care and involvement. And the most difficult bit you did very well. You do need to extend more. A score of 32 equals Ben’s best score of the series so far. Ashley Taylor Dawson and Ola Jordan dance the Paso Doble to Bon Jovi’s You Give Love a Bad Name. They told quite a cowboy story with their dance and it gave Ashley the opportunity to strike a lot of dramatic poses. A nice looking routine which was a crowd pleaser. Darcey: You had the attack and created some strong lines. I would just have liked a bit more drama at the end. Len: I thought it got stronger and stronger. I am surprised how powerfully you danced that. Bruno: The Lone Ranger is back. It was fully loaded and powerful. You had the light and shade especially when you danced with the two professional guys. Craig: That was bizarre and extraordinary. A score of 35 leaves Ashley joint top of the leaderboard with Patrick. Fiona Fullerton and Anton DuBeke performed the American Smooth to Frank Sinatra’s Come Fly With Me. 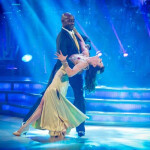 Fiona has been towards the bottom of the leaderboard in recent weeks and was looking to perform something memorable rather than another “forgettable dance” as Craig described last week’s dance. Len: I thought the attitude was first class but the lifts more economy class. It had an air of class about it. Bruno: You were elegant and dainty and I loved your solo. Sometimes when you change direction you look a little lost. You looked really good though. Craig: I would have liked it a bit smoother. The last pivot and lift was a disaster. Darcey: There were some lovely details. It was the preparation in the lifts that you have to work on. It looked a little unfinished. A score of 29 is probably going to leave Fiona in the bottom two on the judges leaderboard. Will Anton’s popularity be enough to keep them out of the dance-off? We will see. Abbey Clancy and Aljaz Skorjanec performed the Quickstep to Walking On Sunshine by Katrina and The Waves. Abbey is a consistent performer and this was another high quality performance. Bruno: That was a quickstep on pleasure beach. The content was out of this world. To do something like this is unbelievable. Craig: There was a lot of gapping and the frame was loose. But these are minor details and I absolutely loved it. Darcey: For a tall leggy lady you show how you can handle those quick moves. Well done. Len: The way you moved and the clarity of movement was very good. A score of 37 with three tens will put a smile on Abbey’s face. 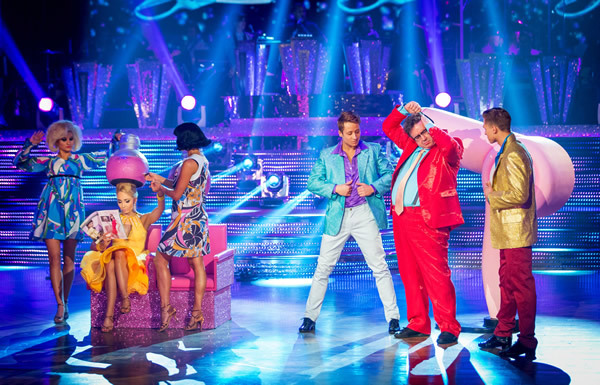 Mark Benton and Iveta Lukosiute Jived to You Can’t Stop the Beat from Hairspray. Mark has been appearing on stage in this musical so it was playing to his comedy strength. It was a bright enough dance but Mark’s technique is unlikely to take him much further in the competition. Craig: It was a little flat footed and stompy. I know it’s entertaining but I’m looking for more technique but I loved the middle hairspray section. Darcey: It was a show stopping performance, full of energy. If you could just get your weight forward. You try really hard. Len: It was fun and lighthearted and there was joy in the performance. Big brash noisy and a pleasure to watch. Bruno: It could have been sharper but I had a wonderful time watching your performance. Mark scored 29 which leaves him joint bottom of the leaderboard with Fiona. 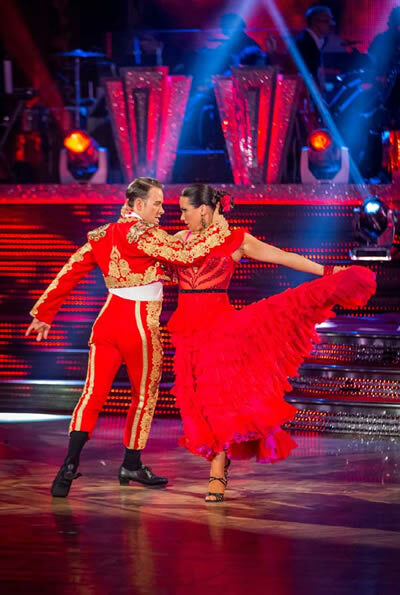 Susanna Reid and Kevin Clifton performed the Paso Doble to Carmen’s Los Toreadors. It was a fiery performance of a traditional Paso; Kevin even had flames burning round him at the start! The studio audience clearly loved the dance and gave them a rapturous standing ovation. Darcey: I loved it. You ate up that dance floor. You are a beautiful gypsy girl. Len: It was like a buffet of Spanish tapas. Tasty morsels all the way through. Bruno: The distilled flavour of Spain was there for all of us to savour. Craig: You were channeling Chita Rivera from West Side story. Absolutely Fab-u-lous. A 39 gives Susanna the best score of the night and the series. She looks like she has a shot at winning Strictly if she can deliver dances at this level. Natalie Gumede and Artem Chigvinstev closed the show dancing the Charleston to Will.i.am’s Bang Bang. Natalie missed last week after fainting and suffering from exhaustion but it didn’t really show. It was a polished performance although the audience reaction seemed a little muted to me. Bruno: A suitable finale to a fantastic night in Blackpool. Craig: I thought the whole thing was sensational. Darcey: You always give us beautiful detail but you have added character and personality. It was a joy to watch. A score of 39 puts Natalie level with Susanna at the top of the leaderboard. So Mark and Fiona are joint bottom with the judges but there are plenty of others who are vulnerable and need the viewers’ votes. We have to wait until the Sunday night results show to find out who has bitten the dust at Blackpool.